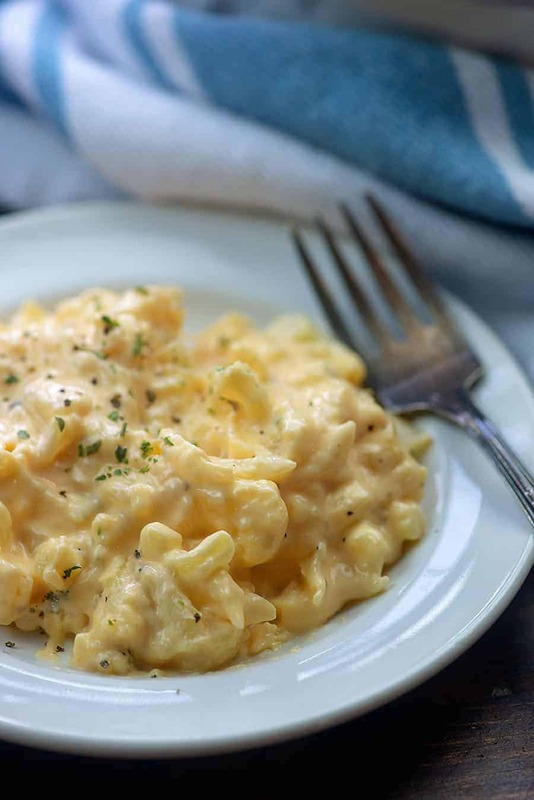 Cauliflower mac and cheese is extra cheesy and melty! This tastes so much like the real deal that I bet you won’t even miss the carbs. Truth time: Cauliflower is not potatoes. It’s not rice. It’s not pasta. It’s not pizza. It’s just that, when done right, it can be a really good sub for those things! Not everyone is going to love the cauliflower recipes, but if you’re on the fence about them, I highly encourage you to keep trying new versions! Because I am here to tell you that a really well done cauliflower recipe is gold. 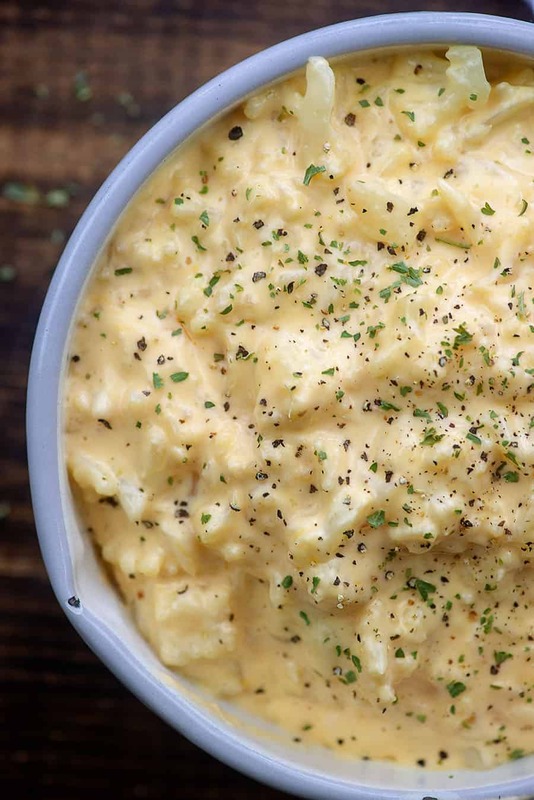 This cauliflower mac and cheese recipe? It’s one of those really well done recipes and you are going. to. love. it. This is NOT just your typical cauliflower drizzled with cheese sauce. The first time I made this my daughter was helping cook dinner and she got really huffy about the cauliflower for mac swap. She insisted that she wasn’t going to like it. She complained right up until I made her try a bite. You guys, the kid RAVED about this cauliflower mac and cheese. She said that it’s the ‘perfect amount of cheese’ and the ‘perfect blend of cheese’ and that it ‘tastes like really good mac and cheese.’ <— Those are all her words! She’s turning into quite the little foodie. And I totally agree with her. We’re going to keep it extra simple, because we’re all busy and no one has time to spend hours whipping up a single side dish for dinner on a busy weeknight. This is a stove top cauliflower mac and cheese, so it’s literally ready from start to finish in about 20 minutes and that includes the time it takes to bring a pot of water to a boil. So, bring some water to a boil over high heat. Chop up some cauliflower into macaroni sized pieces. The smaller size of the pieces is a big key to this recipe, so please don’t leave huge chunks. I usually start with a bag of fresh cauliflower florets instead of a whole head, just because it’s easier and I’m all about a short cut. For the best taste and texture, I don’t recommend frozen cauliflower for this recipe. 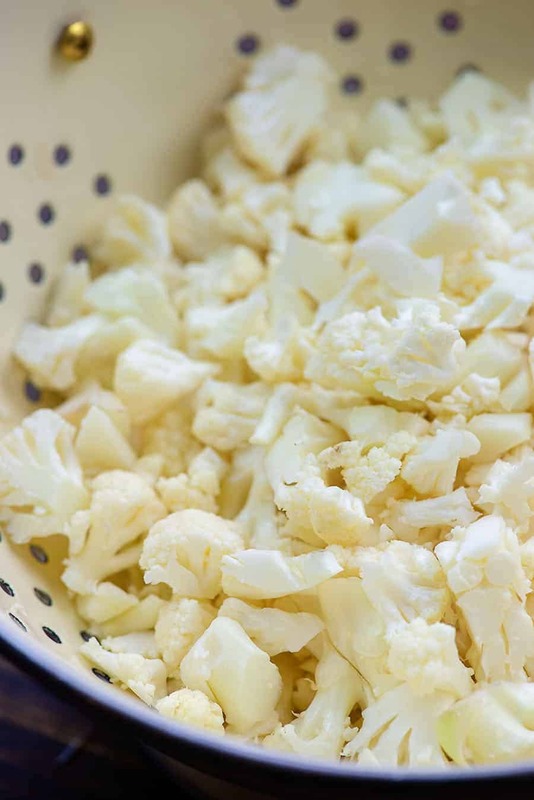 Toss your cauliflower pieces into the boiling water and boil for 5 minutes. Drain away the water and return the cauliflower to the hot pan over low heat. Add in some heavy cream, cream cheese, cheddar, monterey jack, ground mustard, and salt and pepper. Stir this all together until the cheese has melted and everything is well combined, gooey, and irresistible. 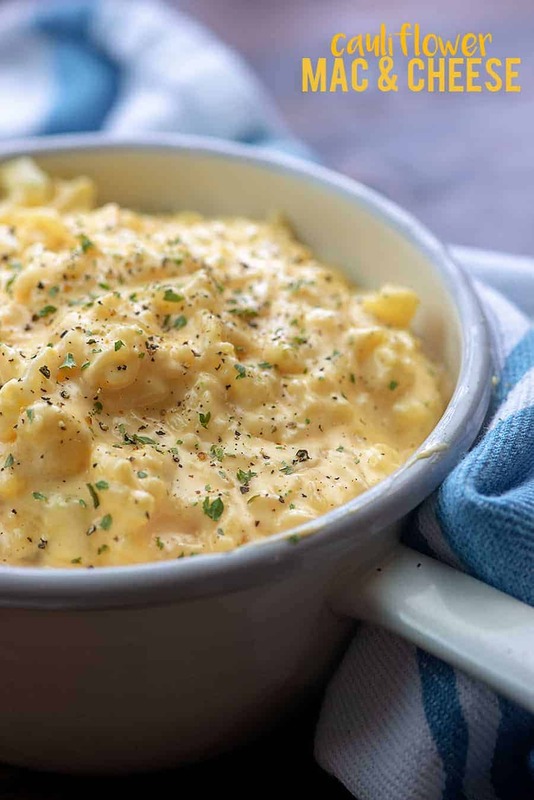 The second key factor in this recipe that differentiates it from your usual steamed cauliflower with a drizzle of cheese sauce to cauliflower mac and cheese is the fact that every little bite is covered in the cheese sauce, just like it would be if this were actual mac and cheese. 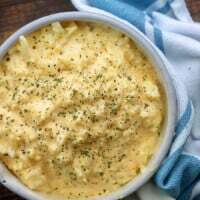 Is cauliflower mac and cheese good? If you like cauliflower even a little bit, I imagine you’ll LOVE this recipe. Some people really hate cauliflower and if that’s you, you might not like this recipe. The cheese really hides the cauliflower though and the texture is a bit softer since it’s boiled, so I would recommend trying this. It’s truly one of our favorites and we think it tastes amazing. 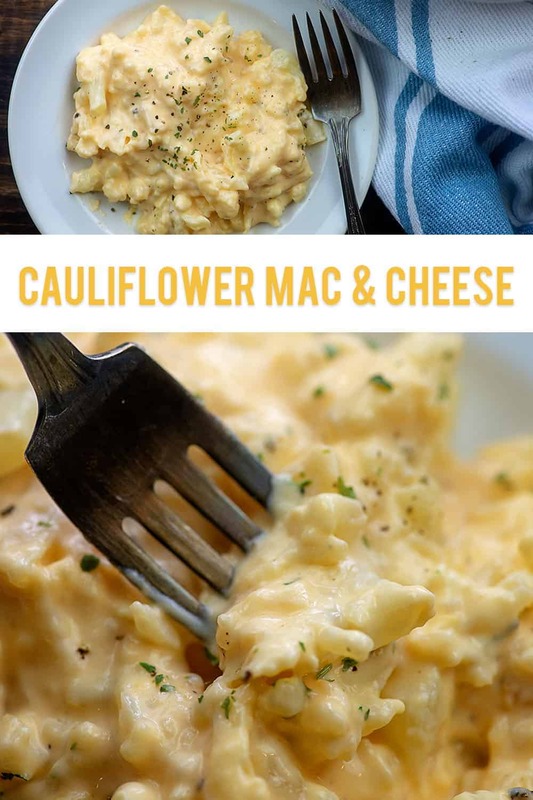 Is cauliflower mac and cheese keto? Yes, it sure is! Check the recipe card below for the macros. What are some other cauliflower recipe to try? Loaded Cauliflower Casserole: This one has all the good stuff from bacon to cheddar to green onions! Cauliflower Potato Salad: Zero potatoes but it tastes like the real deal! Broccoli Cauliflower Soup: This one is a favorite for lunch! Cauliflower Fried Rice: No need for take out! 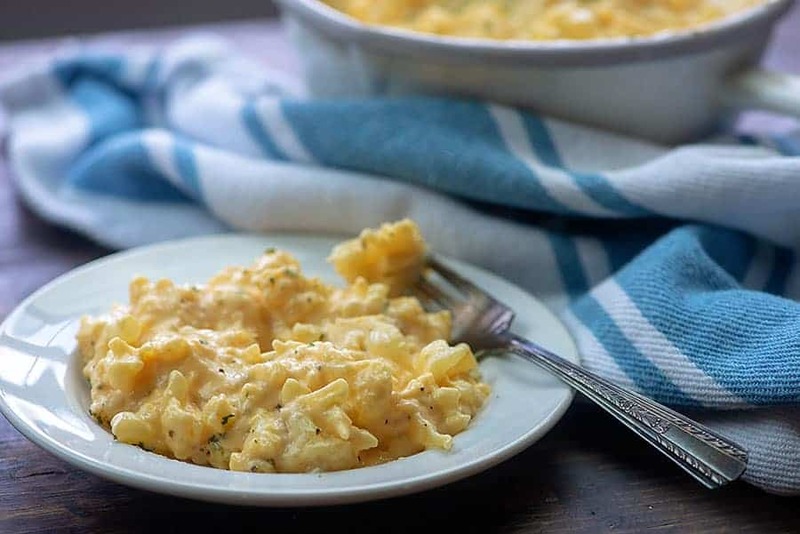 Extra creamy and cheesy cauliflower mac and cheese! This one is both kid friendly and keto friendly! Bring a pot of water to a boil. Add the cauliflower pieces and boil for 5 minutes. Drain the water and return the cauliflower to the pot over low heat. Add the remaining ingredients and stir well until the cheese has melted fully, about 3 minutes. 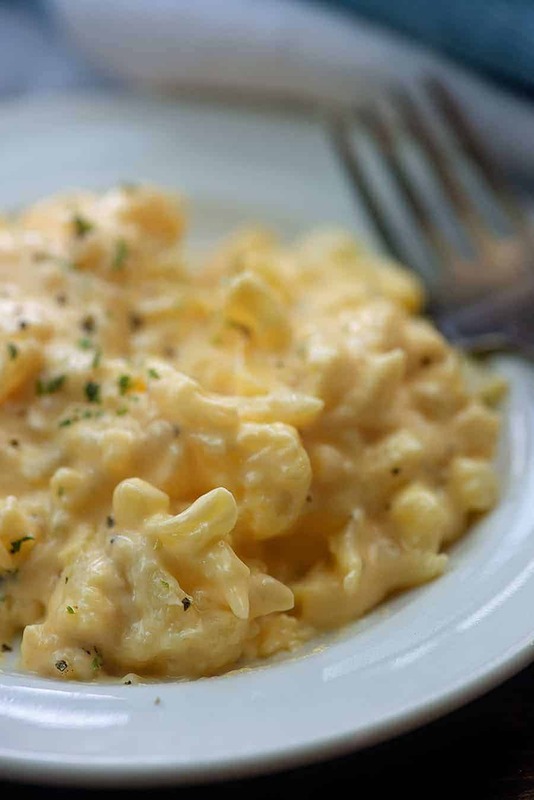 Use whatever blend of cheeses you prefer in your mac and cheese.